Cats are beautiful and majestic animals who have adapted well into the lives of humans through decades. These hilarious cats are very funny and due to their curious nature these furry little animals land in trouble a lot of times. Hopefully, these funny cats learn their lesson. The nature of cats is sometimes strange and funny. They have a very lovable nature, but at times they can be mean. Cats have the unique ability to get stuck in strange positions and these situations are very funny and hilarious. The following are images of few lolcats who have made some hilarious decisions and provide us with the daily dose of laughter. Look at this little feline, he was warned of today’s rain. Still, he decided to venture out of the house for a stroll and the result is for all of us to see. 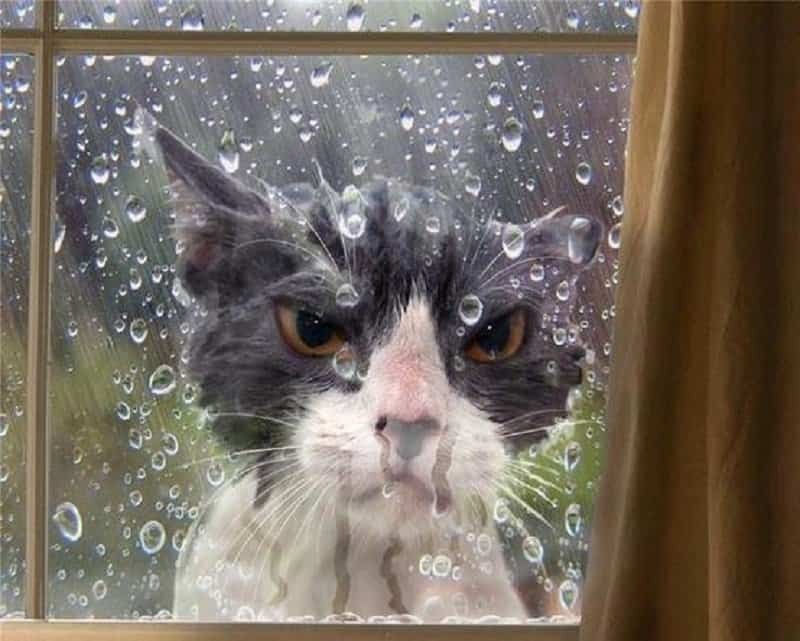 These funny cats even though look hilarious, you can be sure they hate getting wet. His grumpy expression sums it all. The sad look on his face is a message he wants to convey to his owner that he is very upset of his stupid decision to get out of the house even after so many warnings. This hilarious cat learnt his lesson hard way. 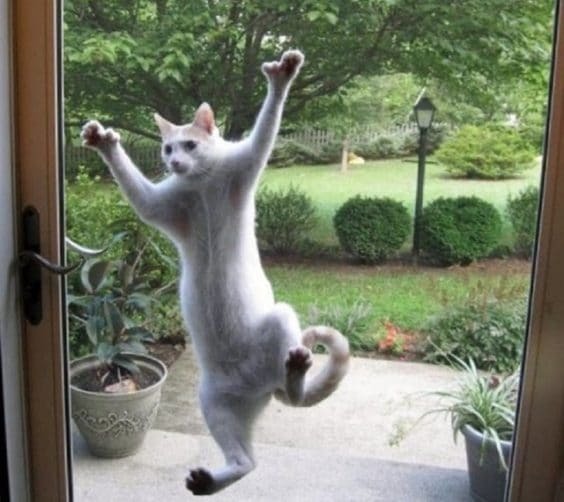 This lolcat jumped out of the house searching for some extra treats, but now he is stuck outside. He wants to come in as he saw his lunch being served, but now he will have to fly and get inside the house. 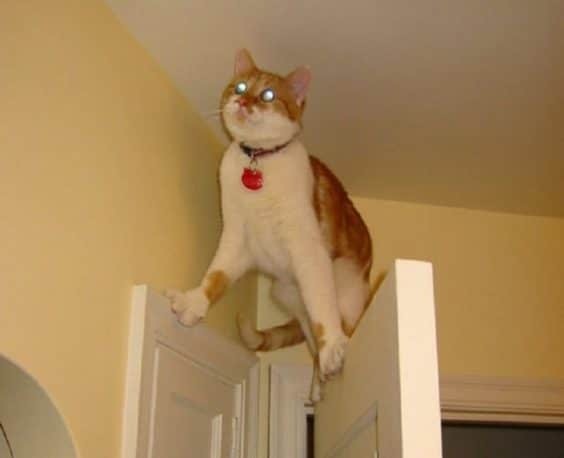 This hilarious cat is practicing his acrobatic and climbing skills for an action movie about cats. A hardworking and funny cat who will not let go. This funny cat was chasing a house lizard on the wall and now he has landed up in an awkward place from where he cannot get down. This guy should have listened to his owner before doing such acrobatic stunts. Now, he is hoping that no one moves the door or else he will land on the floor and might hurt himself. 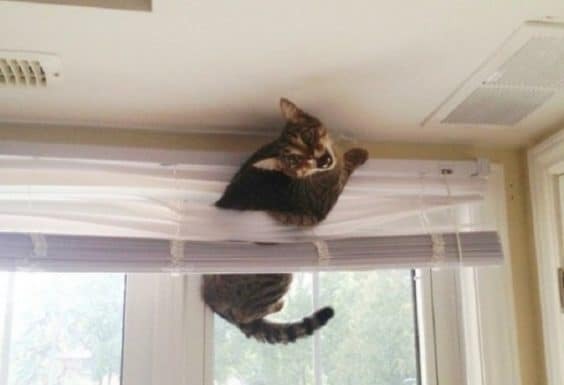 This hilarious cat was planning to adjust the window curtains for his owner. Now, this poor chap has got stuck in between the shades and doesn’t know how to get down. His owner will now have to get his shades repaired once this fella is brought down. We are still wondering, what made him climb the window and work on the shades, probably this guy was not happy with the light coming inside house when he was taking his nap. Cats hate water and always try their best to avoid situations where they can get wet. But, looking at this image it feels this funny cat was in a different mood altogether. He must have thought of catching fresh fish from the waters and made an unsuccessful attempt at it. 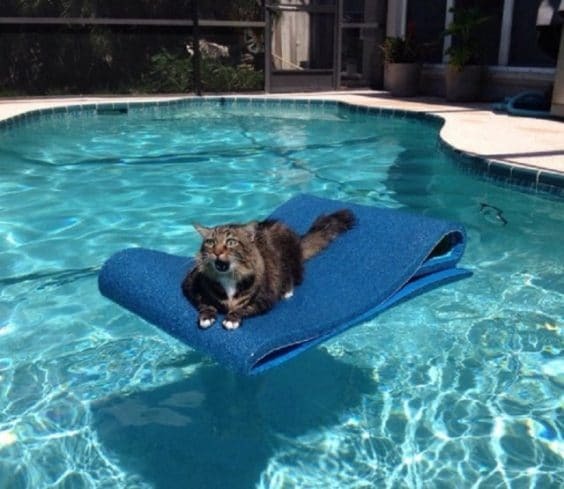 Now, this lolcat is stuck in water and has learnt that this is a swimming pool and he won’t find any fish. Look at his scary expression, poor guy somehow wants to get to the land without getting wet. It’s a pretty scary situation for this poor guy.